A hiking trail at Mountain Laurel offers a respite from the suburban landscape with the sounds of rushing water and bird calls and the occasional chipmunk siting. Mountain Laurel Road ascends from Brookside Drive and winds through a residential neighborhood. A familiar wooden sign along the way marks Mountain Laurel Open Space. A few cars can park safely off the street. You might wonder how the bucolic meadow and the remaining 20-plus acres escaped development, but once you cross the meadow and enter the woods, you'll see why. You'll be on a trail following an unnamed stream along the floor of a large ravine. The steep, rocky slopes looming on either side were probably enough to discourage developers, but the question became moot when the town acquired the property for open space in 1966. The rocky trail (the Walking Guide "red" trail, but marked orange), carpeted with leaves and enveloped by the ravine walls, continues for a quarter mile. It's a secluded, shadowy walk, the silence broken only by rushing water and bird calls. A few chipmunks will express their displeasure at your intrusion. Not surprisingly, there are many thickets of mountain laurel. The trail ends at a jumble of boulders and forest debris. But back at the meadow, you probably noticed trailheads on your left and right. These are actually two ends of an 8/10-mile loop (the "yellow" trail) that runs along the higher elevations of the ravine, dipping down to meet the end of the stream trail. This configuration allows for many hiking variations. You can walk the stream trail out and back, take the loop trail either way, or switch trails where they meet. At the top of the stream trail it's easy to find the east (right-hand) portion of the loop trail in the form of timber stairs climbing uphill. Several paces back down the stream, there are stepping stones leading across to the west portion. The stones have shifted and they can be slippery; I have a scraped-up elbow to prove it. The two sides of the ravine have different features. Along the gentler west side, you'll find two feeder streams, well-preserved stone walls, and sunlit clearings amid very tall trees. The longer east trail climbs steeply from the meadow to a plateau above the ravine. A bird house on a large tree trunk is currently occupied by a screech owl (the third owl I've ever seen) who poked out to watch me pass. You'll quickly sense the terrain to your right opening out, and there's a little ledge you can approach carefully for a dramatic look down a sheer drop into a neighboring ravine. Skip this if you don't like heights, and if you're hiking with kids, keep them close. Just ahead is a fork in the trail. The "secret" right trail will lead you through the woods (and over a huge downed tree) to the "back entrance" of Samp Mortar Rock -- the stepping-stone trail I mentioned in the last column. A side trip to Samp Mortar Rock will vary and expand your hike even more. As the loop trail takes a sharp turn further up, there's an orange trail marker showing you another unmapped trail going uphill. 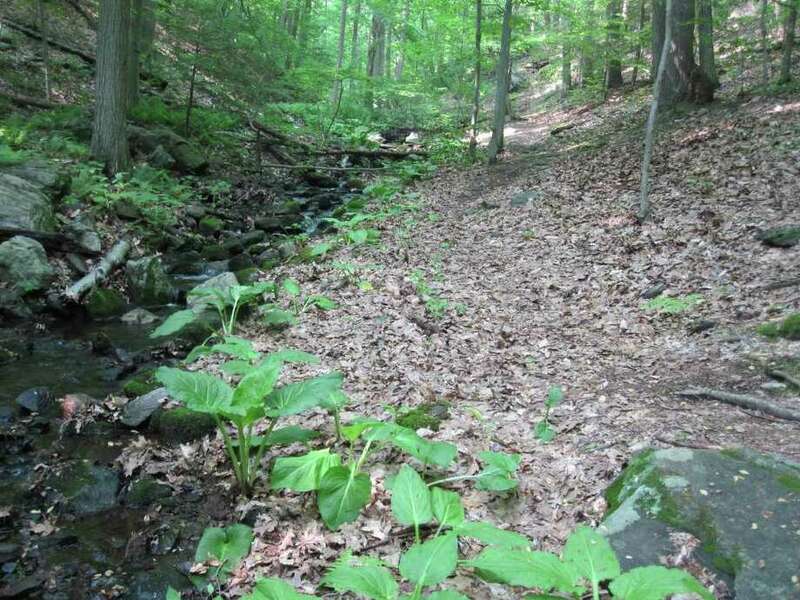 You will find a flat rock clearing offering a commanding view of the ravine. If you look left as you traverse the rocks, you'll pick up a trail through the woods that doubles back to the owl house. There's actually one more trail on this side, but I'll leave it to you to find it. Ron Blumenfeld is a retired pediatrician, member of the Fairfield Board of Health and an experienced hiker.